The following API documentation of OSPRay can also be found as a pdf document. For a deeper explanation of the concepts, design, features and performance of OSPRay also have a look at the IEEE Vis 2016 paper “OSPRay – A CPU Ray Tracing Framework for Scientific Visualization” (49MB, or get the smaller version 1.8MB). The slides of the talk (5.2MB) are also available. where the API is compatible with C99 and C++. To use the API, OSPRay must be initialized with a “device”. A device is the object which implements the API. Creating and initializing a device can be done in either of two ways: command line arguments or manually instantiating a device. Command line parameters accepted by OSPRay’s ospInit. Parameters shared by all devices. This then sets the given device as the object which will respond to all other OSPRay API calls. This function returns the handle to the device currently used to respond to OSPRay API calls, where users can set/change parameters and recommit the device. If changes are made to the device that is already set as the current device, it does not need to be set as current again. Environment variables interpreted by OSPRay. Possible error codes, i.e., valid named constants of type OSPError. to get notified when errors occur. which OSPRay will use to emit status messages. By default, OSPRay uses a callback which does nothing, so any output desired by an application will require that a callback is provided. Note that callbacks for C++ std::cout and std::cerr can be alternatively set through ospInit() or the OSPRAY_LOG_OUTPUT environment variable. Modules are searched in OS-dependent paths. ospLoadModule returns OSP_NO_ERROR if the plugin could be successfully loaded. This API call ensures that the current device is cleaned up appropriately. Due to static object allocation having non-deterministic ordering, it is recommended that applications call ospShutdown() before the calling application process terminates. All entities of OSPRay (the renderer, volumes, geometries, lights, cameras, …) are a specialization of OSPObject and share common mechanism to deal with parameters and lifetime. at which time all previously additions or changes to parameters are visible at the same time. If a user wants to change the state of an existing object (e.g., to change the origin of an already existing camera) it is perfectly valid to do so, as long as the changed parameters are recommitted. The commit semantic allow for batching up multiple small changes, and specifies exactly when changes to objects will occur. This is important to ensure performance and consistency for devices crossing a PCI bus, or across a network. In our MPI implementation, for example, we can easily guarantee consistency among different nodes by MPI barrier’ing on every commit. This decreases its reference count and if the count reaches 0 the object will automatically get deleted. Passing NULL is not an error. // add an untyped pointer -- this will *ONLY* work in local rendering! The call returns an OSPData handle to the created array. The flag OSP_DATA_SHARED_BUFFER indicates that the buffer can be shared with the application. In this case the calling program guarantees that the source pointer will remain valid for the duration that this data array is being used. The enum type OSPDataType describes the different data types that can be represented in OSPRay; valid constants are listed in the table below. Valid named constants for OSPDataType. The call returns NULL if that type of volume is not known by OSPRay, or else an OSPVolume handle. The common parameters understood by all volume variants are summarized in the table below. Configuration parameters shared by all volume types. Note that if voxelRange is not provided for a volume then OSPRay will compute it based on the voxel data, which may result in slower data updates. Structured volumes only need to store the values of the samples, because their addresses in memory can be easily computed from a 3D position. A common type of structured volumes are regular grids. OSPRay supports two variants that differ in how the volumetric data for the regular grids is specified. The first variant shares the voxel data with the application. Such a volume type is created by passing the type string “shared_structured_volume” to ospNewVolume. The voxel data is laid out in memory in xyz-order1 and provided to the volume via a data buffer parameter named “voxelData”. The voxel data pointed to by source is copied into the given volume starting at position regionCoords, must be of size regionSize and be placed in memory in xyz-order. Note that OSPRay distinguishes between volume data and volume parameters. This function must be called only after all volume parameters (in particular dimensions and voxelType, see below) have been set and before ospCommit(volume) is called. If necessary then memory for the volume is allocated on the first call to this function. The common parameters understood by both structured volume variants are summarized in the table below. Additional configuration parameters for structured volumes. AMR volumes are specified as a list of bricks, which are levels of refinement in potentially overlapping regions. There can be any number of refinement levels and any number of bricks at any level of refinement. An AMR volume type is created by passing the type string “amr_volume” to ospNewVolume. Then for each brick, the application should create an OSPData array of OSPData handles, where each handle is the data per-brick. Currently we only support float voxels. Additional configuration parameters for AMR volumes. Lastly, note that the gridOrigin and gridSpacing parameters act just like the structured volume equivalent, but they only modify the root (coarsest level) of refinement. Unstructured volumes can contain tetrahedral, wedge, or hexahedral cell types, and are defined by three arrays: vertices, corresponding field values, and eight indices per cell (first four are -1 for tetrahedral cells, first two are -2 for wedge cells). An unstructured volume type is created by passing the type string “unstructured_volume” to ospNewVolume. Field values can be specified per-vertex (field) or per-cell (cellField). If both values are set, cellField takes precedence. Similar to triangle mesh, each tetrahedron is formed by a group of indices into the vertices. For each vertex, the corresponding (by array index) data value will be used for sampling when rendering. Note that the index order for each tetrahedron does not matter, as OSPRay internally calculates vertex normals to ensure proper sampling and interpolation. For wedge cells, each wedge is formed by a group of six indices into the vertices and data value. Vertex ordering is the same as VTK_WEDGE: three bottom vertices counterclockwise, then top three counterclockwise. For hexahedral cells, each hexahedron is formed by a group of eight indices into the vertices and data value. Vertex ordering is the same as VTK_HEXAHEDRON: four bottom vertices counterclockwise, then top four counterclockwise. Additional configuration parameters for unstructured volumes. The call returns NULL if that type of transfer functions is not known by OSPRay, or else an OSPTransferFunction handle to the created transfer function. That handle can be assigned to a volume as parameter “transferFunction” using ospSetObject. Parameters accepted by the linear transfer function. The call returns NULL if that type of geometry is not known by OSPRay, or else an OSPGeometry handle. Parameters defining a triangle mesh geometry. The vertex and index arrays are mandatory to create a valid triangle mesh. Parameters defining a quad mesh geometry. The vertex and index arrays are mandatory to create a valid quad mesh. A quad is internally handled as a pair of two triangles, thus mixing triangles and quad is supported by encoding a triangle as a quad with the last two vertex indices being identical (w=z). Parameters defining a Subdivision geometry. The vertex and index arrays are mandatory to create a valid subdivision surface. If no face array is present then a pure quad mesh is assumed (and indices must be of type vec4i). Optionally supported are edge and vertex creases. Parameters defining a spheres geometry. A geometry consisting of individual cylinders, each of which can have an own radius, is created by calling ospNewGeometry with type string “cylinders”. The cylinders will not be tessellated but rendered procedurally and are thus perfectly round. To allow a variety of cylinder representations in the application this geometry allows a flexible way of specifying the data of offsets for start position, end position and radius within a data array. All parameters are listed in the table below. Parameters defining a cylinders geometry. For texturing each cylinder is seen as a 1D primitive, i.e., a line segment: the 2D texture coordinates at its vertices v0 and v1 are linearly interpolated. A geometry consisting of multiple streamlines is created by calling ospNewGeometry with type string “streamlines”. The streamlines are internally assembled either from connected (and rounded) cylinder segments, or represented as Bézier curves; they are thus always perfectly round. The parameters defining this geometry are listed in the table below. Parameters defining a streamlines geometry. Each streamline is specified by a set of (aligned) control points in vertex. If smooth is disabled and a constant radius is used for all streamlines then all vertices belonging to the same logical streamline are connected via cylinders, with additional spheres at each vertex to create a continuous, closed surface. Otherwise, streamlines are represented as Bézier curves, smoothly interpolating the vertices. This mode supports per-vertex varying radii (either given in vertex.radius, or in the 4th component of a vec4f vertex), but is slower and consumes more memory. Additionally, the radius needs to be smaller than the curvature radius of the Bézier curve at each location on the curve. A streamlines geometry can contain multiple disjoint streamlines, each streamline is specified as a list of segments (or links) referenced via index: each entry e of the index array points the first vertex of a link (vertex[index[e]]) and the second vertex of the link is implicitly the directly following one (vertex[index[e]+1]). For example, two streamlines of vertices (A-B-C-D) and (E-F-G), respectively, would internally correspond to five links (A-B, B-C, C-D, E-F, and F-G), and would be specified via an array of vertices [A,B,C,D,E,F,G], plus an array of link indices [0,1,2,4,5]. A geometry consisting of multiple curves is created by calling ospNewGeometry with type string “curves”. The parameters defining this geometry are listed in the table below. Parameters defining a curves geometry. See Embree documentation for discussion of curve types and data formatting. 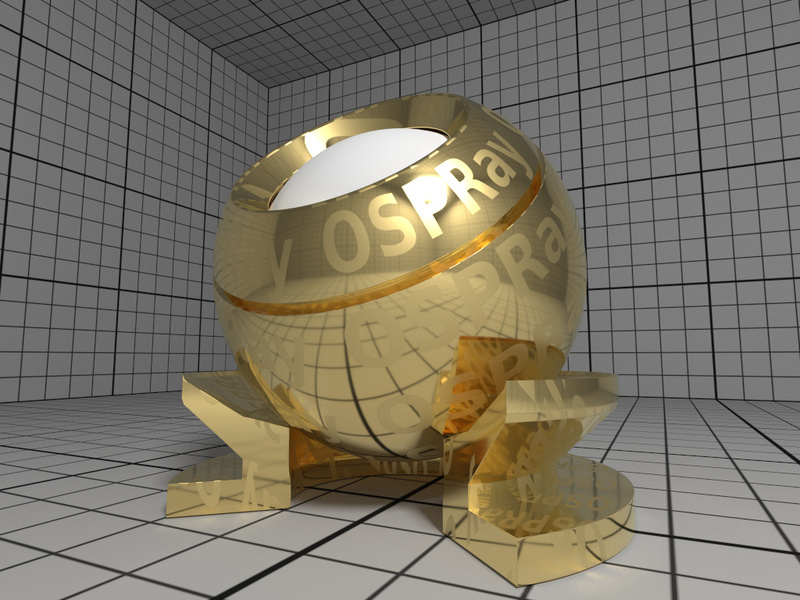 OSPRay can directly render multiple isosurfaces of a volume without first tessellating them. To do so create an isosurfaces geometry by calling ospNewGeometry with type string “isosurfaces”. Each isosurface will be colored according to the provided volume’s transfer function. Parameters defining an isosurfaces geometry. One tool to highlight notable features of volumetric data is to visualize 2D cuts (or slices) by placing planes into the volume. Such a slices geometry is created by calling ospNewGeometry with type string “slices”. The planes are defined by the coefficients (a, b, c, d) of the plane equation ax + by + cz + d = 0. Each slice is colored according to the provided volume’s transfer function. 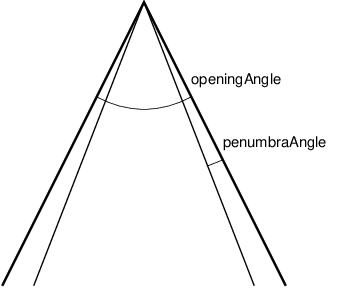 Parameters defining a slices geometry. Parameters understood by all renderers. OSPRay’s renderers support a feature called adaptive accumulation, which accelerates progressive rendering by stopping the rendering and refinement of image regions that have an estimated variance below the varianceThreshold. This feature requires a framebuffer with an OSP_FB_VARIANCE channel. Special parameters understood by the SciVis renderer. Note that the intensity (and color) of AO is deduced from an ambient light in the lights array.2 If aoSamples is zero (the default) then ambient lights cause ambient illumination (without occlusion). Per default the background of the rendered image will be transparent black, i.e., the alpha channel holds the opacity of the rendered objects. This eases transparency-aware blending of the image with an arbitrary background image by the application. The parameter bgColor can be used to already blend with a constant background color (and alpha) during rendering. 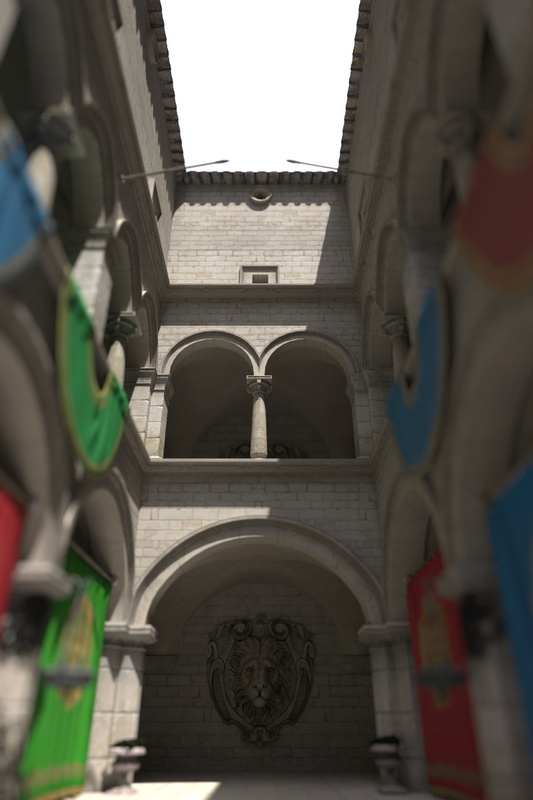 The SciVis renderer supports depth composition with images of other renderers, for example to incorporate help geometries of a 3D UI that were rendered with OpenGL. The screen-sized texture maxDepthTexture must have format OSP_TEXTURE_R32F and flag OSP_TEXTURE_FILTER_NEAREST. 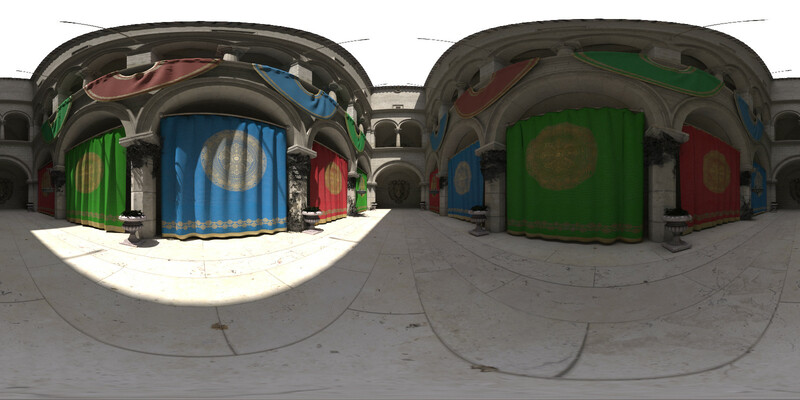 The fetched values are used to limit the distance of primary rays, thus objects of other renderers can hide objects rendered by OSPRay. 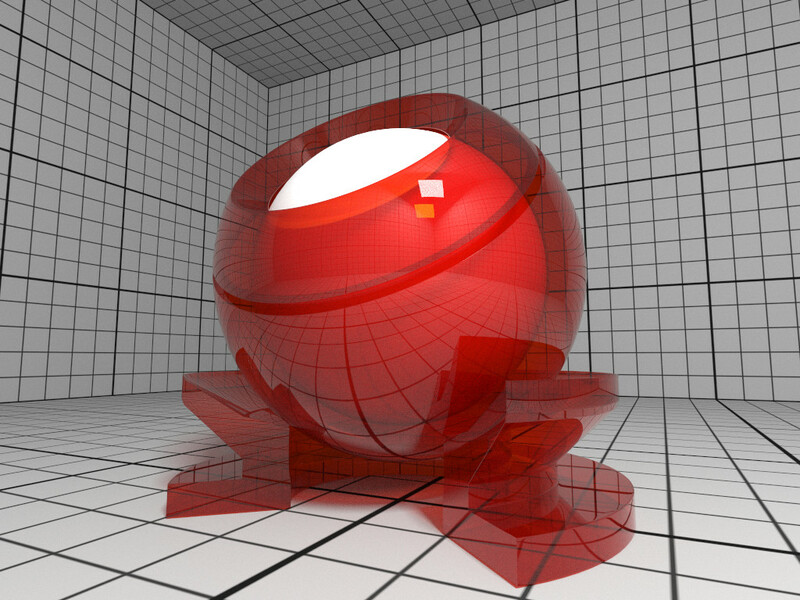 Special parameters understood by the path tracer. The path tracer requires that materials are assigned to geometries, otherwise surfaces are treated as completely black. Parameters accepted by all lights. The following light types are supported by most OSPRay renderers. Special parameters accepted by the distant light. Setting the angular diameter to a value greater than zero will result in soft shadows when the renderer uses stochastic sampling (like the path tracer). For instance, the apparent size of the sun is about 0.53°. Special parameters accepted by the sphere light. Setting the radius to a value greater than zero will result in soft shadows when the renderer uses stochastic sampling (like the path tracer). The spotlight is a light emitting into a cone of directions. It is created by passing the type string “spot” to ospNewLight3. In addition to the general parameters understood by all lights the spotlight supports the special parameters listed in the table. Special parameters accepted by the spotlight. Angles used by the spotlight. Special parameters accepted by the quad light. Defining a quad light which emits toward the reader. The emission side is determined by the cross product of edge1×edge2. 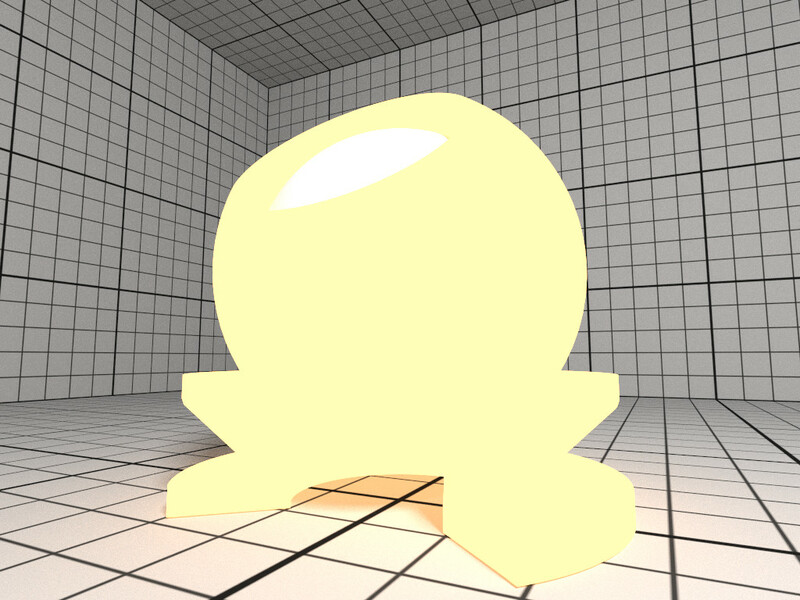 Note that only renderers that use stochastic sampling (like the path tracer) will compute soft shadows from the quad light. Other renderers will just sample the center of the quad light, which results in hard shadows. Special parameters accepted by the HDRI light. 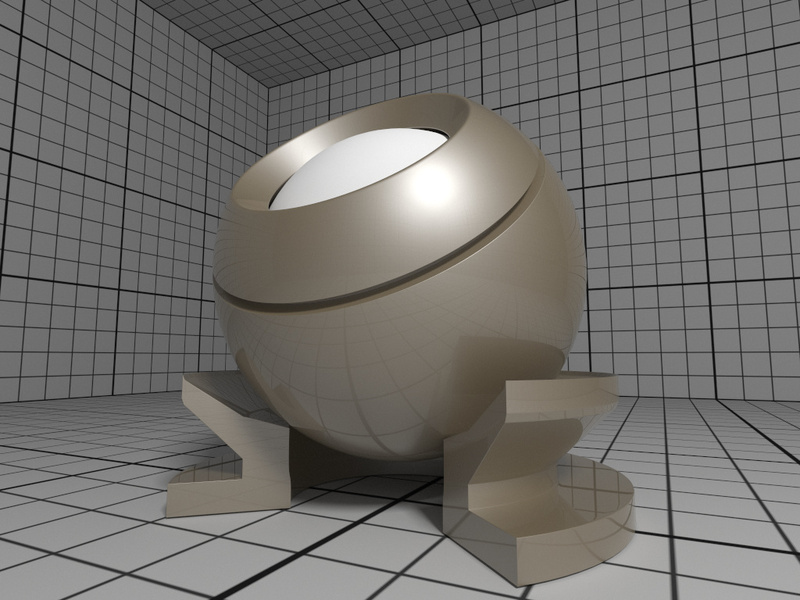 Orientation and Mapping of an HDRI Light. Note that the currently only the path tracer supports the HDRI light. The ambient light surrounds the scene and illuminates it from infinity with constant radiance (determined by combining the parameters color and intensity). It is created by passing the type string “ambient” to ospNewLight3. 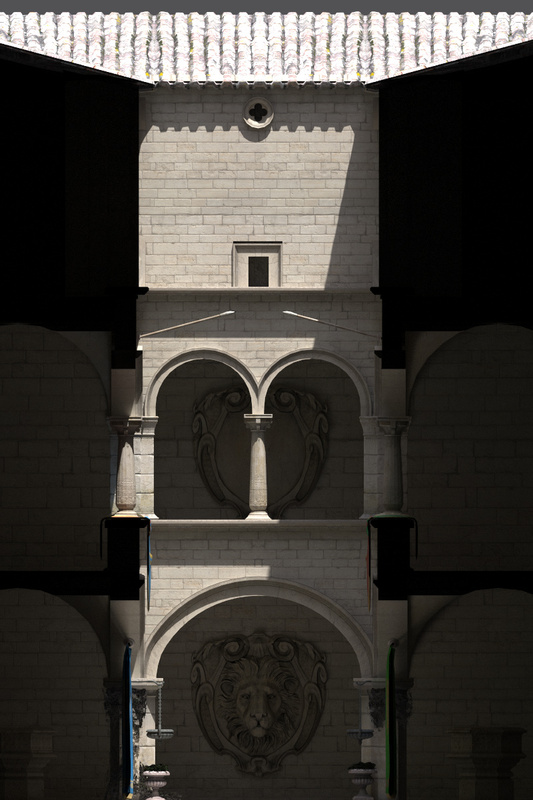 Note that the SciVis renderer uses ambient lights to control the color and intensity of the computed ambient occlusion (AO). The path tracer will consider illumination by geometries which have a light emitting material assigned (for example the Luminous material). Main parameters of the OBJ material. In particular when using the path tracer it is important to adhere to the principle of energy conservation, i.e., that the amount of light reflected by a surface is not larger than the light arriving. 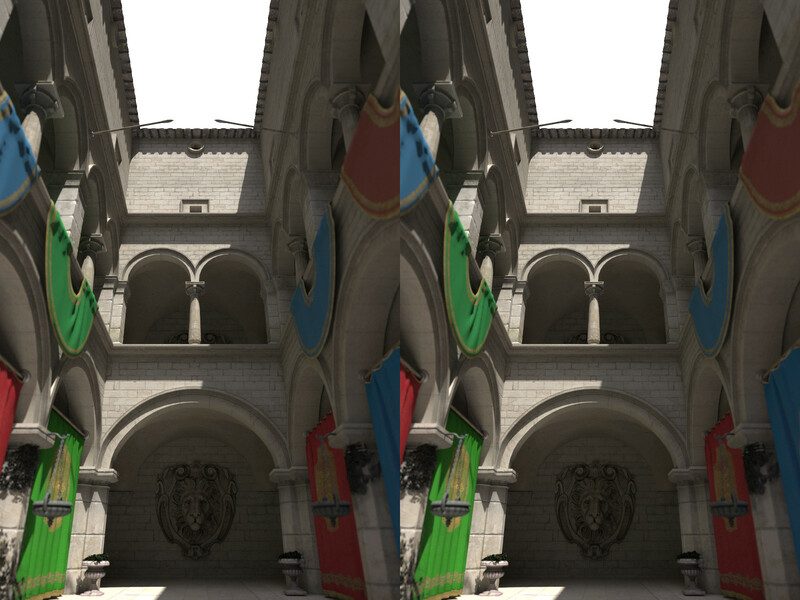 Therefore the path tracer issues a warning and renormalizes the color parameters if the sum of Kd, Ks, and Tf is larger than one in any color channel. Similarly important to mention is that almost all materials of the real world reflect at most only about 80% of the incoming light. So even for a white sheet of paper or white wall paint do better not set Kd larger than 0.8; otherwise rendering times are unnecessary long and the contrast in the final images is low (for example, the corners of a white room would hardly be discernible, as can be seen in the figure below). Comparison of diffuse rooms with 100% reflecting white paint (left) and realistic 80% reflecting white paint (right), which leads to higher overall contrast. Note that exposure has been adjusted to achieve similar brightness levels. If present, the color component of geometries is also used for the diffuse color Kd and the alpha component is also used for the opacity d.
Note that currently only the path tracer implements colored transparency with Tf. Normal mapping can simulate small geometric features via the texture map_Bump. 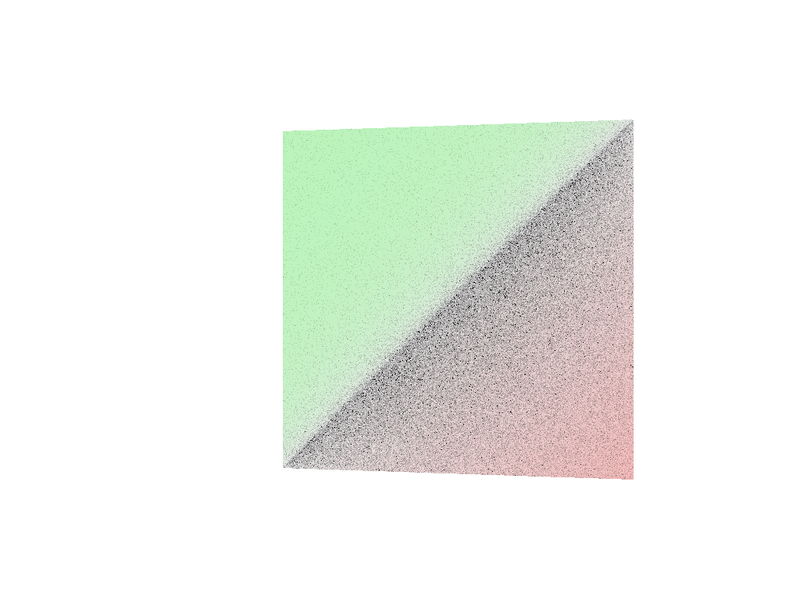 The normals n in the normal map are wrt. the local tangential shading coordinate system and are encoded as ½(n + 1), thus a texel (0.5, 0.5, 1)5 represents the unperturbed shading normal (0, 0, 1). Because of this encoding an sRGB gamma texture format is ignored and normals are always fetched as linear from a normal map. Note that the orientation of normal maps is important for a visually consistent look: by convention OSPRay uses a coordinate system with the origin in the lower left corner; thus a convexity will look green toward the top of the texture image (see also the example image of a normal map). If this is not the case flip the normal map vertically or invert its green channel. Normal map representing an exalted square pyramidal frustum. All parameters (except Tf) can be textured by passing a texture handle, prefixed with “map_”. The fetched texels are multiplied by the respective parameter value. Texturing requires geometries with texture coordinates, e.g., a triangle mesh with vertex.texcoord provided. The color textures map_Kd and map_Ks are typically in one of the sRGB gamma encoded formats, whereas textures map_Ns and map_d are usually in a linear format (and only the first component is used). Additionally, all textures support texture transformations. 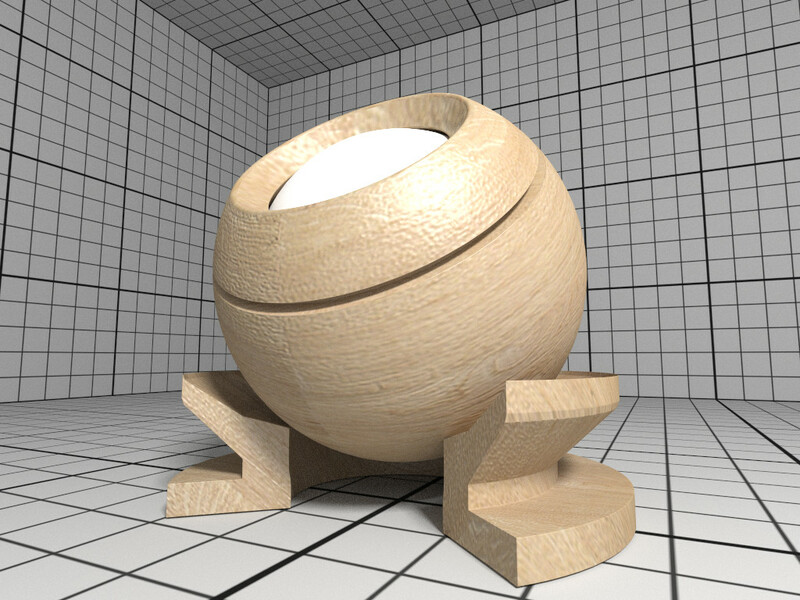 Rendering of a OBJ material with wood textures. The Principled material is the most complex material offered by the path tracer, which is capable of producing a wide variety of materials (e.g., plastic, metal, wood, glass) by combining multiple different layers and lobes. It uses the GGX microfacet distribution with approximate multiple scattering for dielectrics and metals, uses the Oren-Nayar model for diffuse reflection, and is energy conserving. To create a Principled material, pass the type string “Principled” to ospNewMaterial2. Its parameters are listed in the table below. Parameters of the Principled material. All parameters can be textured by passing a texture handle, suffixed with “Map” (e.g., “baseColorMap”); texture transformations are supported as well. Rendering of a Principled coated brushed metal material with textured anisotropic rotation and a dust layer (sheen) on top. The CarPaint material is a specialized version of the Principled material for rendering different types of car paints. To create a CarPaint material, pass the type string “CarPaint” to ospNewMaterial2. Its parameters are listed in the table below. Parameters of the CarPaint material. Rendering of a pearlescent CarPaint material. Parameters of the Metal material. The main appearance (mostly the color) of the Metal material is controlled by the physical parameters eta and k, the wavelength-dependent, complex index of refraction. These coefficients are quite counterintuitive but can be found in published measurements. For accuracy the index of refraction can be given as an array of spectral samples in ior, each sample a triplet of wavelength (in nm), eta, and k, ordered monotonically increasing by wavelength; OSPRay will then calculate the Fresnel in the spectral domain. Alternatively, eta and k can also be specified as approximated RGB coefficients; some examples are given in below table. Index of refraction of selected metals as approximated RGB coefficients, based on data from https://refractiveindex.info/. The roughness parameter controls the variation of microfacets and thus how polished the metal will look. The roughness can be modified by a texture map_roughness (texture transformations are supported as well) to create notable edging effects. 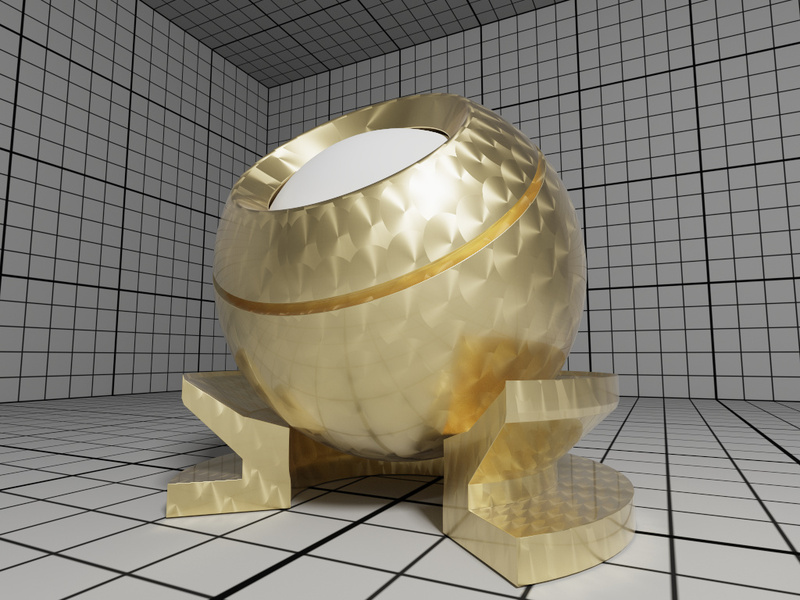 Rendering of golden Metal material with textured roughness. Parameters of the Alloy material. The main appearance of the Alloy material is controlled by the parameter color, while edgeColor influences the tint of reflections when seen at grazing angles (for real metals this is always 100% white). If present, the color component of geometries is also used for reflectivity at normal incidence color. As in Metal the roughness parameter controls the variation of microfacets and thus how polished the alloy will look. All parameters can be textured by passing a texture handle, prefixed with “map_”; texture transformations are supported as well. Rendering of a fictional Alloy material with textured color. Parameters of the Glass material. For convenience, the rather counterintuitive physical attenuation coefficients will be calculated from the user inputs in such a way, that the attenuationColor will be the result when white light traveled trough a glass of thickness attenuationDistance. 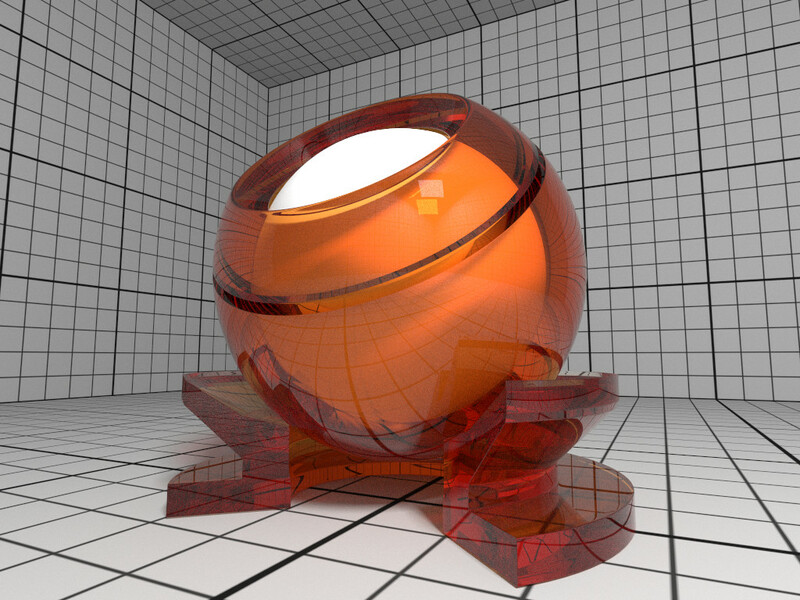 Rendering of a Glass material with orange attenuation. Parameters of the ThinGlass material. For convenience the attenuation is controlled the same way as with the Glass material. Additionally, the color due to attenuation can be modulated with a texture map_attenuationColor (texture transformations are supported as well). If present, the color component of geometries is also used for the attenuation color. The thickness parameter sets the (virtual) thickness and allows for easy exchange of parameters with the (real) Glass material; internally just the ratio between attenuationDistance and thickness is used to calculate the resulting attenuation and thus the material appearance. Rendering of a ThinGlass material with red attenuation. Example image of a colored window made with textured attenuation of the ThinGlass material. The path tracer offers a metallic paint material, consisting of a base coat with optional flakes and a clear coat. To create a MetallicPaint material pass the type string “MetallicPaint” to ospNewMaterial2. Its parameters are listed in the table below. Parameters of the MetallicPaint material. The color of the base coat baseColor can be textured by a texture map_baseColor, which also supports texture transformations. If present, the color component of geometries is also used for the color of the base coat. Parameter flakeAmount controls the proportion of flakes in the base coat, so when setting it to 1 the baseColor will not be visible. The shininess of the metallic component is governed by flakeSpread, which controls the variation of the orientation of the flakes, similar to the roughness parameter of Metal. Note that the effect of the metallic flakes is currently only computed on average, thus individual flakes are not visible. Rendering of a MetallicPaint material. The path tracer supports the Luminous material which emits light uniformly in all directions and which can thus be used to turn any geometric object into a light source. It is created by passing the type string “Luminous” to ospNewMaterial2. The amount of constant radiance that is emitted is determined by combining the general parameters of lights: color and intensity. Rendering of a yellow Luminous material. OSPRay currently implements two texture types (texture2d and volume) and is open for extension to other types by applications. More types may be added in future releases. The call returns NULL if the texture could not be created with the given parameters, or else an OSPTexture handle to the created texture. Supported texture formats by texture2D, i.e., valid constants of type OSPTextureFormat. The texel data addressed by source starts with the texels in the lower left corner of the texture image, like in OpenGL. Per default a texture fetch is filtered by performing bi-linear interpolation of the nearest 2×2 texels; if instead fetching only the nearest texel is desired (i.e., no filtering) then pass the OSP_TEXTURE_FILTER_NEAREST flag. Parameters to define texture coordinate transformations. The transformations are applied in the given order. Rotation, scale and translation are interpreted “texture centric”, i.e., their effect seen by an user are relative to the texture (although the transformations are applied to the texture coordinates). Parameters accepted by all cameras. The camera is placed and oriented in the world with pos, dir and up. OSPRay uses a right-handed coordinate system. The region of the camera sensor that is rendered to the image can be specified in normalized screen-space coordinates with imageStart (lower left corner) and imageEnd (upper right corner). This can be used, for example, to crop the image, to achieve asymmetrical view frusta, or to horizontally flip the image to view scenes which are specified in a left-handed coordinate system. Note that values outside the default range of [0–1] are valid, which is useful to easily realize overscan or film gate, or to emulate a shifted sensor. The perspective camera implements a simple thinlens camera for perspective rendering, supporting optionally depth of field and stereo rendering, but no motion blur. It is created by passing the type string “perspective” to ospNewCamera. In addition to the general parameters understood by all cameras the perspective camera supports the special parameters listed in the table below. Parameters accepted by the perspective camera. Note that when computing the aspect ratio a potentially set image region (using imageStart & imageEnd) needs to be regarded as well. In architectural photography it is often desired for aesthetic reasons to display the vertical edges of buildings or walls vertically in the image as well, regardless of how the camera is tilted. Enabling the architectural mode achieves this by internally leveling the camera parallel to the ground (based on the up direction) and then shifting the lens such that the objects in direction dir are centered in the image. If finer control of the lens shift is needed use imageStart & imageEnd. Because the camera is now effectively leveled its image plane and thus the plane of focus is oriented parallel to the front of buildings, the whole façade appears sharp, as can be seen in the example images below. Example image created with the perspective camera, featuring depth of field. Enabling the architectural flag corrects the perspective projection distortion, resulting in parallel vertical edges. Example 3D stereo image using stereoMode side-by-side. Parameters accepted by the orthographic camera. For convenience the size of the camera sensor, and thus the extent of the scene that is captured in the image, can be controlled with the height parameter. The same effect can be achieved with imageStart and imageEnd, and both methods can be combined. In any case, the aspect ratio needs to be set accordingly to get an undistorted image. Example image created with the orthographic camera. The panoramic camera implements a simple camera without support for motion blur. It captures the complete surrounding with a latitude / longitude mapping and thus the rendered images should best have a ratio of 2:1. A panoramic camera is created by passing the type string “panoramic” to ospNewCamera. It is placed and oriented in the scene by using the general parameters understood by all cameras. Latitude / longitude map created with the panoramic camera. Note that ospPick considers exactly the same camera of the given renderer that is used to render an image, thus matching results can be expected. If the camera supports depth of field then the center of the lens and thus the center of the circle of confusion is used for picking. Supported color formats of the framebuffer that can be passed to ospNewFrameBuffer, i.e., valid constants of type OSPFrameBufferFormat. The parameter frameBufferChannels specifies which channels the framebuffer holds, and can be combined together by bitwise OR from the values of OSPFrameBufferChannel listed in the table below. Framebuffer channels constants (of type OSPFrameBufferChannel), naming optional information the framebuffer can store. These values can be combined by bitwise OR when passed to ospNewFrameBuffer or ospFrameBufferClear. If a certain channel value is not specified, the given buffer channel will not be present. Note that OSPRay makes a clear distinction between the external format of the framebuffer and the internal one: The external format is the format the user specifies in the format parameter; it specifies what color format OSPRay will eventually return the framebuffer to the application (when calling ospMapFrameBuffer): no matter what OSPRay uses internally, it will simply return a 2D array of pixels of that format, with possibly all kinds of reformatting, compression/decompression, etc., going on in-between the generation of the internal framebuffer and the mapping of the externally visible one. In particular, OSP_FB_NONE is a perfectly valid pixel format for a framebuffer that an application will never map. For example, an application driving a display wall may well generate an intermediate framebuffer and eventually transfer its pixel to the individual displays using an OSPPixelOp pixel operation. Note that OSP_FB_ACCUM or OSP_FB_VARIANCE cannot be mapped. The origin of the screen coordinate system in OSPRay is the lower left corner (as in OpenGL), thus the first pixel addressed by the returned pointer is the lower left pixel of the image. When selected, OSP_FB_COLOR will clear the color buffer to black (0, 0, 0, 0), OSP_FB_DEPTH will clear the depth buffer to inf. OSP_FB_ACCUM will clear all accumulating buffers (OSP_FB_VARIANCE, OSP_FB_NORMAL, and OSP_FB_ALBEDO, if present) and resets the accumulation counter accumID. The call returns NULL if that type is not known, or else an OSPPixelOp handle to the created pixel operation. The tone mapper is a pixel operation which implements a generic filmic tone mapping operator. Using the default parameters it approximates the Academy Color Encoding System (ACES). The tone mapper is created by passing the type string “tonemapper” to ospNewPixelOp. The tone mapping curve can be customized using the parameters listed in the table below. Parameters accepted by the tone mapper. To use the popular “Uncharted 2” filmic tone mapping curve instead, set the parameters to the values listed in the table below. 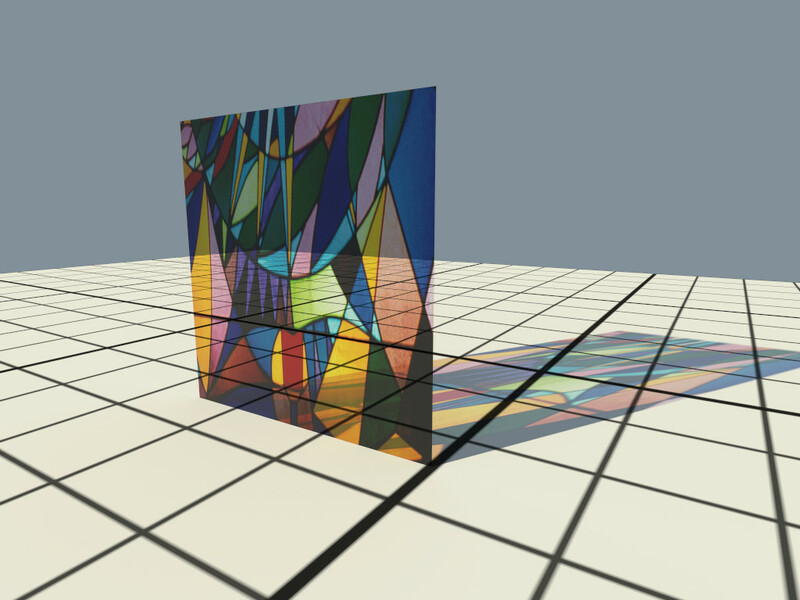 Filmic tone mapping curve parameters. Note that the curve includes an exposure bias to match 18% middle gray. The third parameter specifies what channel(s) of the framebuffer is written to6. What to render and how to render it depends on the renderer’s parameters. If the framebuffer supports accumulation (i.e., it was created with OSP_FB_ACCUM) then successive calls to ospRenderFrame will progressively refine the rendered image. If additionally the framebuffer has an OSP_FB_VARIANCE channel then ospRenderFrame returns an estimate of the current variance of the rendered image, otherwise inf is returned. The estimated variance can be used by the application as a quality indicator and thus to decide whether to stop or to continue progressive rendering. The provided user pointer userPtr is passed as first argument to the callback function7 and the reported progress is in (0–1]. If the callback function returns zero than the application requests to cancel rendering, i.e., the current ospRenderFrame will return at the first opportunity and the content of the framebuffer will be undefined. Therefore, better clear the framebuffer with ospFrameBufferClear then before a subsequent call of ospRenderFrame. Passing NULL as OSPProgressFunc function pointer disables the progress callback. OSPRay has the ability to scale to multiple nodes in a cluster via MPI. This enables applications to take advantage of larger compute and memory resources when available. To build the MPI module the CMake option OSPRAY_MODULE_MPI must be enabled, which can be done directly on the command line (with -DOSPRAY_MODULE_MPI=ON) or through a configuration dialog (ccmake, cmake-gui), see also Compiling OSPRay. This will trigger CMake to go look for an MPI implementation in your environment. You can then inspect the CMake value of MPI_LIBRARY to make sure that CMake found your MPI build environment correctly. OSPRay provides two ways of using MPI to scale up rendering: offload and distributed. The “offload” rendering mode is where a single (not-distributed) calling application treats the OSPRay API the same as with local rendering. However, OSPRay uses multiple MPI connected nodes to evenly distribute frame rendering work, where each node contains a full copy of all scene data. 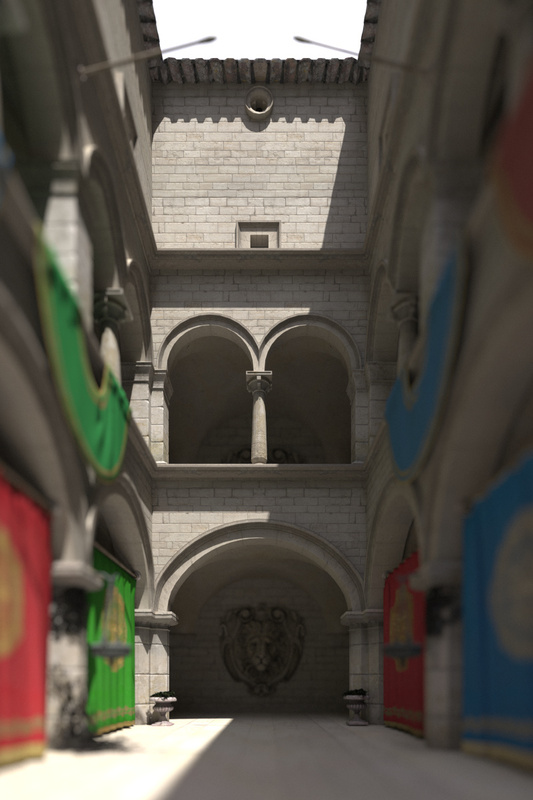 This method is most effective for scenes which can fit into memory, but are expensive to render: for example, path tracing with many samples-per-pixel is compute heavy, making it a good situation to use the offload feature. This can be done with any application which already uses OSPRay for local rendering without the need for any code changes. When doing MPI offload rendering, applications can optionally enable dynamic load balancing, which can be beneficial in certain contexts. This load balancing refers to the distribution of tile rendering work across nodes: thread-level load balancing on each node is still dynamic with the thread tasking system. The options for enabling/controlling the dynamic load balancing features on the mpi_offload device are found in the table below, which can be changed while the application is running. Please note that these options will likely only pay off for scenes which have heavy rendering load (e.g., path tracing a non-trivial scene) and have much variance in how expensive each tile is to render. Parameters specific to the mpi_offload device. The “distributed” rendering mode is where a MPI distributed application (such as a scientific simulation) uses OSPRay collectively to render frames. In this case, the API expects all calls (both created objects and parameters) to be the same on every application rank, except each rank can specify arbitrary geometries and volumes. Each renderer will have its own limitations on the topology of the data (i.e., overlapping data regions, concave data, etc. ), but the API calls will only differ for scene objects. Thus all other calls (i.e., setting camera, creating framebuffer, rendering frame, etc.) will all be assumed to be identical, but only rendering a frame and committing the model must be in lock-step. This mode targets using all available aggregate memory for huge scenes and for “in-situ” visualization where the data is already distributed by a simulation app. As an example, our sample viewer can be run as a single application which offloads rendering work to multiple MPI processes running on multiple machines. The example apps are setup to be launched in two different setups. In either setup, the application must initialize OSPRay with the offload device. This can be done by creating an “mpi_offload” device and setting it as the current device (via the ospSetCurrentDevice() function), or passing either “--osp:mpi” or “--osp:mpi-offload” as a command line parameter to ospInit(). Note that passing a command line parameter will automatically call ospLoadModule("mpi") to load the MPI module, while the application will have to load the module explicitly if using ospNewDevice(). This method of launching the application and OSPRay worker separately works best for applications which do not immediately call ospInit() in their main() function, or for environments where application dependencies (such as GUI libraries) may not be available on compute nodes. Applications using the new distributed device should initialize OSPRay by creating (and setting current) an “mpi_distributed” device or pass "--osp:mpi-distributed" as a command line argument to ospInit(). Note that due to the semantic differences the distributed device gives the OSPRay API, it is not expected for applications which can already use the offload device to correctly use the distributed device without changes to the application. The following additional parameter can be set on the mpi_distributed device. Parameters for the mpi_distributed device. void* worldCommunicator A pointer to the MPI_Comm which should be used as OSPRay’s world communicator. This will set how many ranks OSPRay should expect to participate in rendering. The default is MPI_COMM_WORLD where all ranks are expected to participate in rendering. By setting the worldCommunicator parameter to a different communicator than MPI_COMM_WORLD the client application can tune how OSPRay is run within its processes. The default uses MPI_COMM_WORLD and thus expects all processes to also participate in rendering, thus if a subset of processes do not call collectives like ospRenderFrame the application would hang. For example, an MPI parallel application may be run with one process per-core, however OSPRay is multithreaded and will perform best when run with one process per-node. By splitting MPI_COMM_WORLD the application can create a communicator with one rank per-node to then run OSPRay on one process per-node. The remaining ranks on each node can then aggregate their data to the OSPRay process for rendering. The model used by the distributed device takes three additional parameters, to allow users to express their data distribution to OSPRay. All models should be disjoint to ensure correct sort-last compositing. Geometries used in the distributed MPI renderer can make use of the SciVis renderer’s OBJ material. Parameters for the distributed OSPModel. int id An integer that uniquely identifies this piece of distributed data. For example, in a common case of one sub-brick per-rank, this would just be the region’s MPI rank. Multiple ranks can specify models with the same ID, in which case the rendering work for the model will be shared among them. vec3f region.lower Override the original model geometry + volume bounds with a custom lower bound position. This can be used to clip geometry in the case the objects cross over to another region owned by a different node. 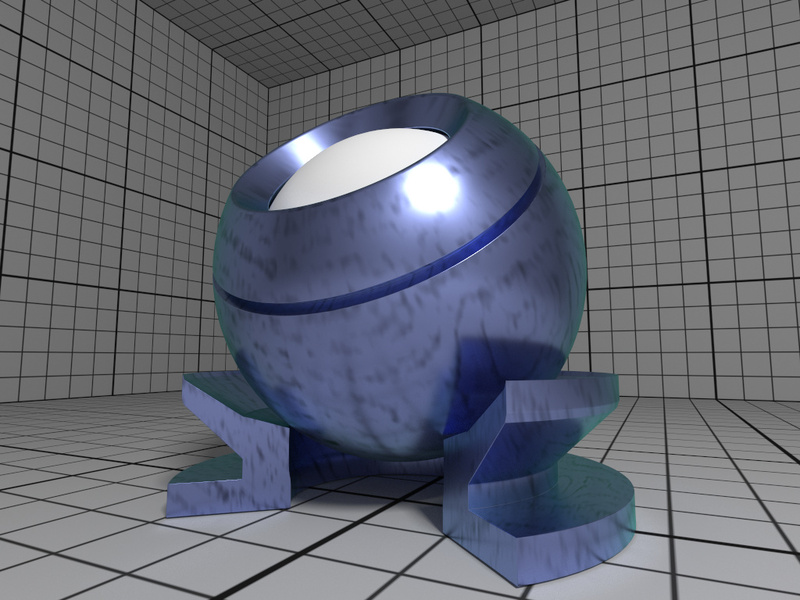 For example, rendering a set of spheres with radius. vec3f region.upper Override the original model geometry + volume bounds with a custom upper bound position. The renderer supported when using the distributed device is the mpi_raycast renderer. This renderer is an experimental renderer and currently only supports ambient occlusion (on the local data only, with optional ghost data). To compute correct ambient occlusion across the distributed data the application is responsible for replicating ghost data and specifying the ghost models and models as described above. Note that shadows and ambient occlusion are computed on the local geometries, in the model and the corresponding ghostModel in the ghost model array, if any where set. Parameters for the mpi_raycast renderer. See the distributed device examples in the MPI module for examples. WARNING: USE AT YOUR OWN RISK. The Scene graph is currently in Alpha mode and will change frequently. It is not yet recommended for critical production work. The scene graph is the basis of our Example Viewer which consists of a superset of OSPRay objects represented in a graph hierarchy (currently a tree). This graph functions as a hierarchical specification for scene properties and a self-managed update graph. The scene graph infrastructure includes many convenience functions for templated traversals, queries of state and child state, automated updates, and timestamped modifications to underlying state. The scene graph nodes closely follow the dependencies of existing OSPRay API internals, i.e., a sg::Renderer has a “model” child, which in turn has a “TriangleMesh”, which in turn has a child named “vertex” similar to how you may set the “vertex” parameter on the osp::TriangleMesh which in turn is added to an OSPModel object which is set as the model on the OSPRenderer. The scene graph is a superset of OSPRay functionality so there is no direct 1:1 mapping between the scene graph hierarchy in all cases, however it is kept as close as possible. This makes the scene graph viewer in the [Example Viewer] a great way to understand OSPRay state. The explore the full set of nodes, simply launch the Example Viewer and traverse through the GUI representation of all scene graph nodes. This call accesses the child named “lights” on the renderer, and in turn the child named “sun”. This child then gets its own child of a newly created node with the name “intensity" of type float with a value of 0.3f. When committed, this node will call ospSet1fwith the node value on the current OSPObject on the context which is set by the parent. If you were to create a custom light called”MyLight" and had a float parameter called “flickerFreq”, a similar line would be used without requiring any additional changes in the scene graph internals beyond registering the new light class. Known parameters such as floats will also show up in the Example Viewer GUI without requiring any additional code beyond adding them to the scene graph and the internal implementation in OSPRay. The base passes required to use the scene graph include verification, commit, and render traversals. Every node in the scene graph has a valid state which needs to be set before operating on the node. Nodes may have custom qualifications for validity, but by default they are set through valid_ flags on the scene graph Node for things like whitelists and range checks. Once verified, commit traverses the scene graph and commits scene graph state to OSPRay. Commits are timestamped, so re-committing will only have any affect if a dependent child has been modified requiring a new commit. Because of this, each node does not have to track if it is valid or if anything in the scene has been modified, as commit will only be called on that node if those are already true. By default invalid nodes with throw exceptions, however this can be turned off which enables the program to keep running. In the Example Viewer GUI, invalid nodes will be marked in red but the previously committed state will keep rendering until the invalid state is corrected. return nodes;// TODO: should this be a move (i.e., reader 'consumes')? The scene graph is only thread safe for accessing and setting values on nodes. More advanced operations like adding or removing nodes are not thread safe. At some point we hope to add transactions to handle these, but for now the scene graph nodes must be added/removed on the same thread that is committing and rendering. Running ospTutorial will create two images of two triangles, rendered with the Scientific Visualization renderer with full Ambient Occlusion. The first image firstFrame.ppm shows the result after one call to ospRenderFrame – jagged edges and noise in the shadow can be seen. Calling ospRenderFrame multiple times enables progressive refinement, resulting in antialiased edges and converged shadows, shown after ten frames in the second image accumulatedFrames.ppm. More apps will be created in future releases to further demonstrate other interesting OSPRay features. 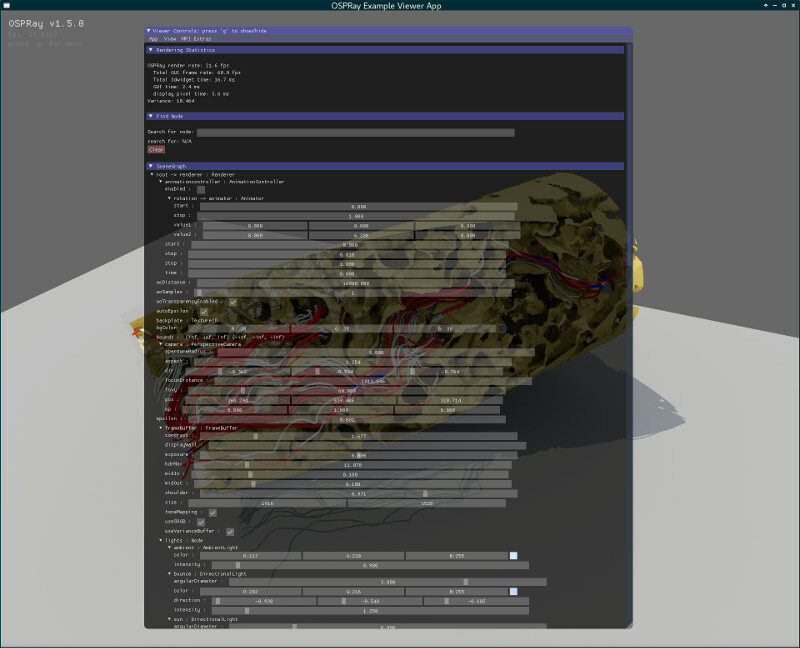 Screenshot of using ospExampleViewer with a scene graph. OSPRay includes an exemplary viewer application ospExampleViewer, showcasing most features of OSPRay which can be run as ./ospExampleViewer [options] <filename>. The Example Viewer uses the ImGui library for user interface controls and is based on a prototype OSPRay scene graph interface where nodes can be viewed and edited interactively. Updates to scene graph nodes update OSPRay state automatically through the scene graph viewer which is enabled by pressing ‘g’. The GUI shows the entire state of the program under the root scene graph node. Expanding nodes down to explore and edit the scene is possible, for example a material parameter may be found under renderer→world→mesh→material→Kd. Updates to values will be automatically propagated to the next render. Individual nodes can be easily found using the “Find Node” section, which will find nodes with a given name based on the input string. Scene objects can also be selected with the mouse by shift-left clicking in the viewer. Click on nodes to expand their children, whose values can be set by dragging or double clicking and typing in values. You can also add new nodes where appropriate: for example, when “lights” is expanded right clicking on “lights” and selecting create new node and typing in a light type, such as “PointLight”, will add it to the scene. Similarly, right clicking on “world” and creating an “Importer” node will add a new scene importer from a file. Changing the filename to an appropriate file will load the scene and propagate the resulting state. Exporting and importing the scene graph is only partially supported at the moment through “ospsg” files. Currently, any nodes with Data members will break this functionality, however right clicking and selecting export on the camera or lights nodes for instance will save out their respective state which can be imported on the command line. The Example Viewer also functions as an OSPRay state debugger – invalid values will be shown in red up the hierarchy and will not change the viewer until corrected. Volumes are loaded into the viewer just as a mesh is. Volume appearance is modified according to the transfer function, which will show up in a popup window on the GUI after pressing ‘g’. Click and drag across the transfer function to set opacity values, and selecting near the bottom of the editable transfer function widget sets the opacity to zero. The colors themselves can only be modified by selecting from the dropdown menu ‘ColorMap’ or importing and exporting json colors. The range that the transfer function operates on can be modified on the scene graph viewer. Right click and drag or mouse wheel to zoom in and out. Mouse-Wheel click will pan the camera. Shift-Left click on an object will zoom into that part of the scene and set the focal distance. Running ./ospExampleViewer -help will bring up a list of command line options. These options allow you to load files, run animations, modify any scene graph state, and many other functions. See the demos page for examples. Supported file importers currently include: obj, ply, x3d, vtu, osp, ospsg, xml (rivl), points, xyz. When the example viewer is built with OpenImageDenoise, the denoiser is automatically enabled when running the application. It can be toggled on/off at runtime via the useDenoiser GUI parameter found under the framebuffer in the scene graph. The application ospDistribViewerDemo demonstrates how to write a distributed SciVis style interactive renderer using the distributed MPI device. Note that because OSPRay uses sort-last compositing it is up to the user to ensure that the data distribution across the nodes is suitable. Specifically, each nodes’ data must be convex and disjoint. 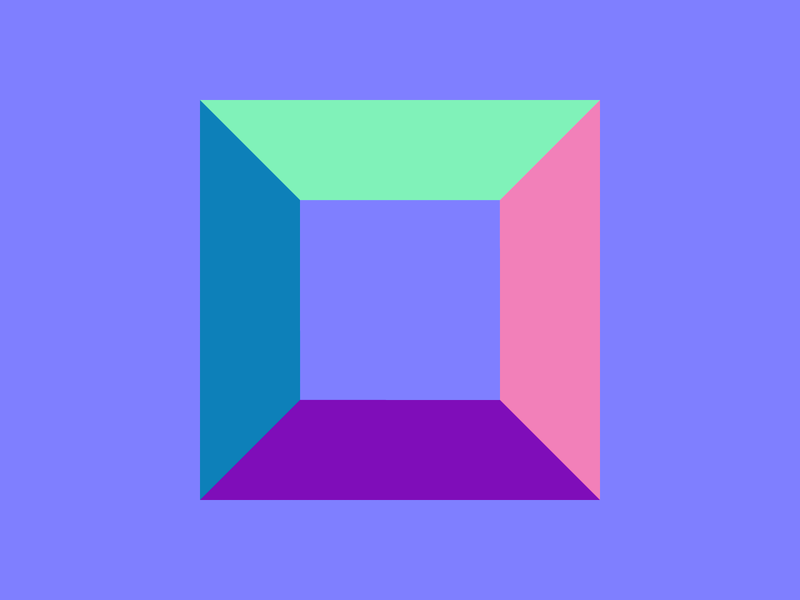 This renderer supports multiple volumes and geometries per node. To ensure they are composited correctly you specify a list of bounding regions to the model, within these regions can be arbitrary volumes/geometries and each rank can have as many regions as needed. As long as the regions are disjoint/convex the data will be rendered correctly. In this demo we either generate a volume, or load a RAW volume file if one is passed on the command line. The volume file will then be chunked up into an x×y×z grid such that n = xyz. See loadVolume in gensv/generateSciVis.cpp for an example of how to properly load a volume distributed across ranks with correct specification of brick positions and ghost voxels for interpolation at boundaries. If no volume file data is passed a volume will be generated instead, in that case see makeVolume. The viewer can also display some randomly generated sphere geometry if you pass -spheres <n> where n is the number of spheres to generate per-node. These spheres will be generated inside the bounding box of the region’s volume data. In the case that you have geometry crossing the boundary of nodes and are replicating it on both nodes to render (ghost zones, etc.) the region will be used by the renderer to clip rays against allowing to split the object between the two nodes, with each rendering half. This will keep the regions rendered by each rank disjoint and thus avoid any artifacts. For example, if a sphere center is on the border between two nodes, each would render half the sphere and the halves would be composited to produce the final complete sphere in the image. Passing the -appMPI flag will have the application initialize MPI instead of letting OSPRay do it internally when creating the MPI distributed device. In this case OSPRay will not finalize MPI when cleaning up the device, allowing the application to use OSPRay for some work, shut it down and recreate everything later if needed for additional computation, without accidentally shutting down its MPI communication. Rank 0 will open an interactive window with GLFW and display the rendered image. When the application state needs to update (e.g., camera or transfer function changes), this information is broadcasted out to the other nodes to update their scene data. Several ready-to-run demos, models and data sets for OSPRay can be found at the OSPRay Demos and Examples page.